Bhajans are simple songs in soulful language expressing the many splendor emotions of love for god. The App is a collection of a variety of composition including varnams,kritis,swarajatis,padams,bhajans and thiruppugazhs. The vocal mastery and versatility across 6 languages Tamil,Telgu,Kannada,Malyalam,Sanskit and Hindi and heart warming music will make you feel one with God. The rich voice of Jagjit Singh will enamour and soothe your nerves. 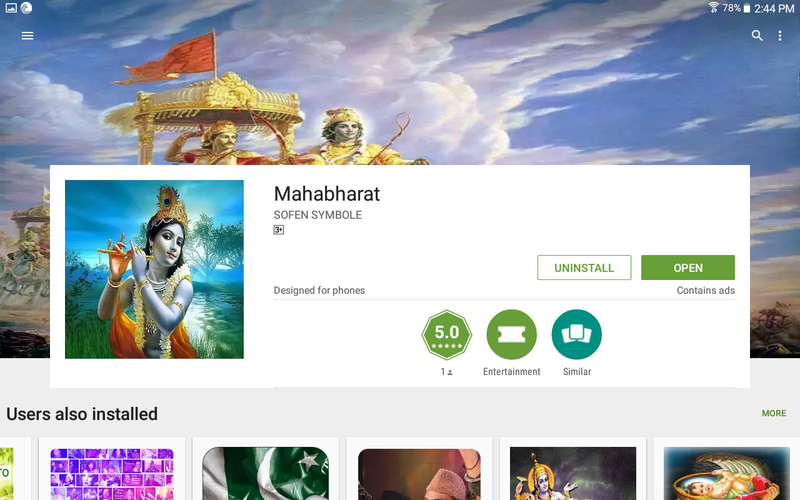 The App has Shri Krishna Sankeertan and Shri Aadishakti Sankeertan. Shri Krishna Govind Hare Murari,jaI Ambe jagdambe are the main songs. The App consists of SP or Balu’s cream collection of his devotional songs,categorized deity wise Ayyappan,Amman,Ganapathy,Hanuman,Venkatsaswara,Shiva. Beautiful songs and great music with magical voice. The App contains beautiful collection of devotional songs sung by ghazal samrat Anup Jalota. You can download the songs and share it too on social sites. The App has top 30 hit bhajans from Anuradha Paudwal. The App is simple and effortlessly you can play the Piano. Not only you can learn the piano you can right away start playing it and at any speed. It has 128 musical MIDI instruments, 12 studio quality sampled voices and more than 50,000 songs (most of them are not free). The App lets you learn or play as you like and there are no forced instructions. You feel you are really playing a violin! It will take you couple of minutes to learn the instructions and then the music starts to flow. It helps you to learn the violin and play songs with a simulated bow on the screen. You can Choose to play on your own or a song from library with prompt notes. It lets you record your songs and there are daily challenges to get extra points. Choose between viola or cello and have fun. You have a band of your own on the phone! The App is a toolkit of virtual musical instruments with piano, guitar, drum kit,drum machine, bass,multitrack synthesizer and more. All the instruments use realistic instrument sounds. Add guitar and drum beats to your piano melody or mix whatever you like. External MIDI keyboard over USB is supported. You can also connect your yamaha or Roland keyboard with the App. Now play music anywhere on your phone. The App provides the in depth analysis of your phone usage. You can see it as hourly,daily or weekly. You can also check which app you used for how long. It has features like take a break or scheduled breaks where in you can customize what apps you want or how the phone should work be it incoming calls or any app. There is missed notification center which collects all the information for your use so won’t miss anything. The App helps in getting over addiction to your phone in a very interesting way. You plant a tree and let it grow for next 30 minutes, if you go to check your Facebook or any other app the tree will wither away. There is a white list which let’s you check the apps. The less you use the more trees you can grow. Reward point helps you get more species for your forest! The App helps you in blocking the addictive apps or those which you don’t want to use for a specific period of time. It also stops the application to launch on its own,disable the notification and helps you in concentrating on your work. This App helps in keeping your work organised. Take note,checklist, to-dos,drafts,scan,take notes in PDFs,attach Microsoft Office docs,photos and does much more. It syncs automatically across any phone or computer so you can start your task on one and finish on any other device. You can share your ideas,discuss it and get feedbacks. Clip and highlight articles from Web. The App helps you in integrating all areas of your academic life. Here you can see if your homework is due,classes, classes which conflict with your exams,revision task for exam,track your task,get notified for unfinished tasks and much more. The App helps students in organizing the thoughts, remembering things and generating new ideas. It is easy to use and has different layouts to choose from. It supports multiple mind maps on one page. The App helps in getting over addiction to your phone while studying in a very interesting way. You plant a tree and let it grow for next 30 minutes, if you go to check your Facebook or any other app the tree will wither away. There is a white list which let’s you check the apps . Reward point helps you get more species for your forest! The App helps students to to keep track of daily attendance in various subjects with user friendly calender. You make calendar for each subject and can add note to it.Attendance percentage is calculated and displayed underneath the calendar. Small and handy App. It answers the top 50 questions about breast cancer most searched on net. You can also search for particular keyword or question. There are videos to help show how to examine your breast and a BMI tracker to show how to maintain a healthy weight to reduce the risk. The App helps you in keeping all the information about your situation in one place and gives you overview to help you in discussions with your doctor. The also helps in keeping track of your mood,treatment,pain and lots more. 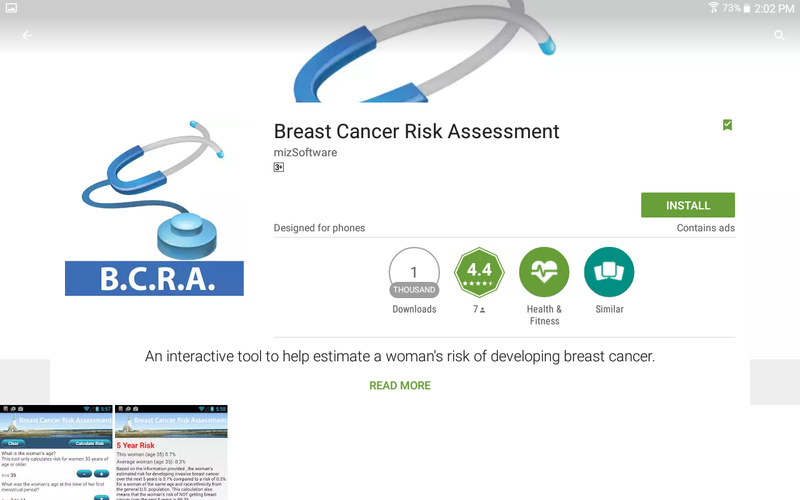 The Breast Cancer Risk Assessment Appis an interactive tool designed by scientists to estimate a women’s risk of developing invasive breast cancer. The tool does keep ethnicity in mind. The App is updated regularly. The App provides specific information about personalized cancer treatments and also is a guide where in you can find and ask questions about your progression, should you get surgery or radiation or chemotherapy and more. You can also keep track of your appointments, support group meetings and other dates. The App provides complete information regarding male breastfeeding cancer including symptoms and treatment. In ancient times faith healing was widely accepted as the only form of medicine for both physical and mental health problems.The App contains a book about Christian faith healing and all about healing from Jesus and how to follow it. The App contains comprehensive book for General health issues and their cure with reference from Quran and Hadith. It discusses the precise health issues and their symptoms and the Islamic cures. The App aims to facilitate communication between doctors and patients and how it’s treatment should take place according to Halachah the Jewish law. The App helps in definition of disease, its cure,symptoms Ayurvedic view,lifestyle advices and home remedies. Ayurveda is linked to Hindu relegion. The App contains the book on healing practice of Native American and how to follow it today according to the tribal culture. It tells you all about the knowledge of medicine,herbs,feathers and much more. The Mahabharata is the longest known epic poem and has been described as “the longest poem ever written”. Its longest version consists of over 100000 shloka or over 200000 individual verse lines (each shloka is a couplet), and long prose passages. About 1.8 million words in total, the Mahabharata is roughly ten times the length of the Iliad and the Odyssey combined. The epic is often ambiguous, and most authors try to fill in the blanks with their own ideas of what they think might have happened. The podcast idea by Lawrence Manzo is to simply present the ambiguities, explore the possible explanations, but still leaving it up to the listener to decide on what to believe. Very simple and lite App without any advertising is the best. The App has the epic both in sanskrit and English. The translation is good and can be enjoyed. The App presents the epic in story firm and is easy to understand. It has lot of spelling mistakes and misinformation but overall can be enjoyed if one wants to read and understand Mahabharata fast. 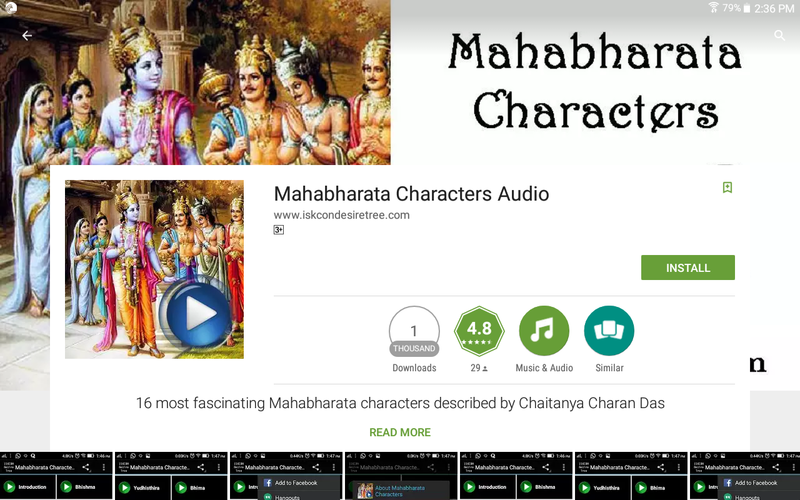 The App helps you know with audio about Mahabharata and the contemporary relevance of the Indian wisdom and traditions. The biographies of main characters of Mahabharata is discussed in detail. The App has all the links of the most famous series of Indian Television with English subtitles. The story is presented in a beautiful dance and drama play.